We are noted for providing various types of marble artifacts that are mainly used for decorative purposes and all of which are durable and can last for a longer period of time. 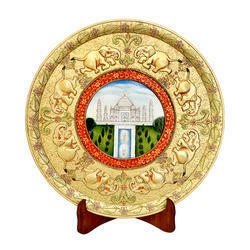 Among all, this Marble Plate King on Ambabari Elephant deserve special mention. These are made under the leading expert advice and by using high end raw materials that are available near hand. Owing to our experience that we have gathered in this field, we have started manufacturing some high grade marble plates for our users. These are durable and the printed picture is going to last for a long time. We are noted as one of the topmost manufacturers and exporters of high end Antique Marble Plate which is known for its fine texture, smooth finish and lovely designs. The pictures of tigers printed in the middle makes it even more beautiful and stunning for all to look and purchase. It is surely going to enhance the beauty of the whole room. We are one of the leading manufacturers and exporters of top grade Floral Design Marble Plate that is known for its gorgeous beauty and also lovely color combination. 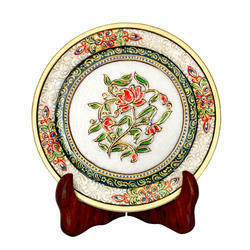 The border of this plate is marked with red and golden color which makes it all the more beautiful among all. Our users can get quality products from us at market leading prices and these are going to get delivered within the given time period. With years of experience we have finally came up with high quality Gold Work Marble Plate that is made using top most quality raw materials and some equally expert machines and tools. These are all procured from vendors who are associated with our field for some years now. Users are also going to get top class services as we will deliver these products to the desired end without much hassle. 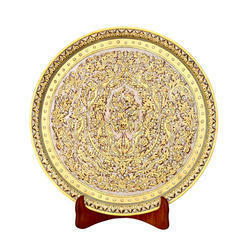 After years of experience in this firm, we are able to manufacture high quality Indian God Marble Plate (Salasar Plate) that is too good and can last for a longer period of time. This product is known for its rugged design, good strength and also for a longer lasting effect. These are made using high end products and at par with the international market level. 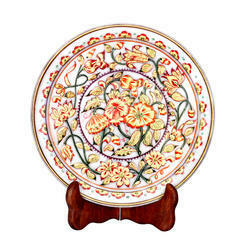 If you are looking for the perfect gift that will bring a broad smile on everyone face, then this Jewellery Design Plate can be the best option that is available near hand. This plate is known for its rugged design, smooth texture, fine finish and glossy glow of high quality marble. This is well decorated with a design of a neckpiece that is made using different bright colors along with a golden touch in it. 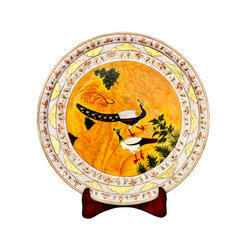 We offer Marble Plate which is intricately designed and made with real gold artistic work. This portrait is very eye catching and very beautiful. This product is quite appealing to look at and is made by our top artist. 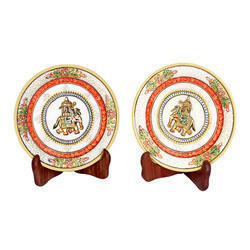 We have used very good quality of raw material for this special plate and the wooden stand is included with this plate to decor. 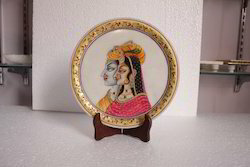 We are counted amongst the topmost manufacturers and suppliers of high end Marble Plate with Portrait that is decorated with good class paintings that are made using high class colors. 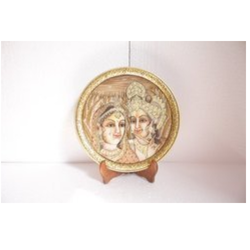 The beautiful picture of Radha and Krishna is creating good effect on the marble background. One can get quality Portrait on Plate from us at market leading prices and all these are delivered within stipulated time period. We are noted as the foremost supplier of high quality Marble Plate with Portrait Design that is also manufactured by us, with the help of our competent manufacturing unit. We use all the modern facilities that are used for making top quality products from us at reasonable price range. These also use top grade raw materials that are procured from reliable vendors. 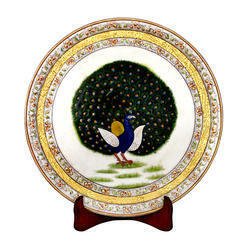 We are noted as one of the topmost manufacturers of high quality Peacock Design Plate that is available from us at market leading prices. 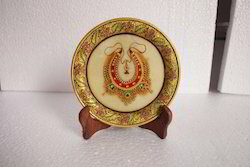 This piece has two peacocks facing each other and those are designed using gold touches along with other vibrant colors that will enhance the beauty more. One can also try out our site as we provide such products at reasonable rates. For the religious people out there, we are offering top grade marble plate that has some beautiful and jaw dropping picture engraved on it. 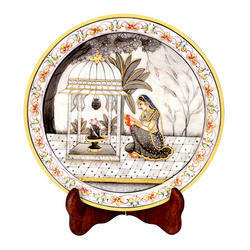 Among various marble plates that we have in store, the Radha Krishna Marble Plate is one of the most demanding one. 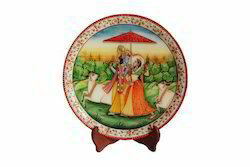 The picture of radha and Krishna are made using different bright and vibrant colors along with the golden border, covering the plate from all sides. 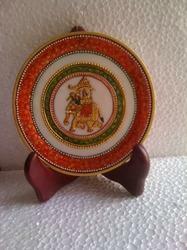 It is Marble 6"size Plate with Elephant portrait of gold art work. 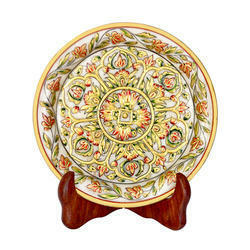 It looks beautiful and gives nice decor to your place when placing this plate on the wooden stand, which is included with this plate. In order to get high quality product, one can rely upon us for quality services and durable products. These are made at par with the international market standard and are going to get delivered within the stipulated time period. 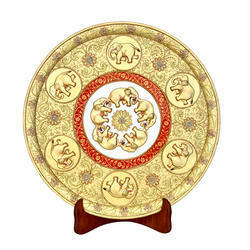 Users are going to get their desirable products like this Marble Elephant Plate which is finely designed with a picture of elephant placed right in the middle. Packaging Details: Packing is in velvet box. 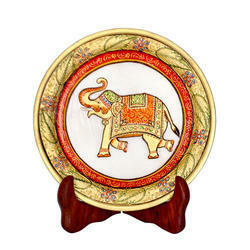 We offer Marble Plate with wooden stand which is intricately designed and made with real gold artistic work. This product is quite appealing to look at and is made by our top artist. We have used very good quality of raw material for this special plate and the wooden stand is included with this plate to decor. We are noted as one of the topmost manufacturers and exporters of high end Antique Marble Plate which is known for its fine texture, smooth finish and lovely designs. 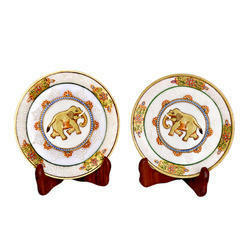 We offer Marble Plate Elephant Print which is intricately designed and made with real gold artistic work. This product is quite appealing to look at and is made by our top artist. 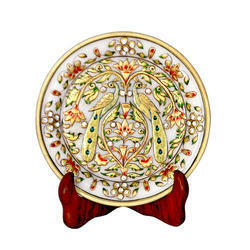 We have used very good quality of raw material for this special plate and the wooden stand is included with this plate to decor. 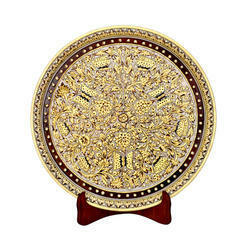 We offer Marble Plate which is intricately designed and made with real gold artistic work. This product is quite appealing to look at and is made by our top artist. 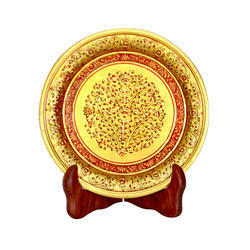 We have used very good quality of raw material for this special plate and the wooden stand is included with this plate to decor.